Kothimora means khukuri having silver scabbard. The case is exclusively designed using pure silver filigree with top quality velvet background. Different beautiful patterns are carved having cultural and traditional values using only domestic tools. 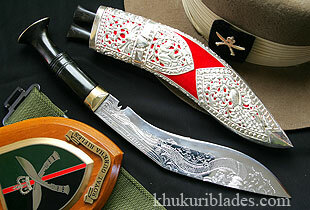 It is a very special and old type of khukuri used for ceremonies and given as gifts to mark respect and appreciation. This is also so called because of the dragon carved on the blade. The khukuri is beautifully engraved with dragons on both sides to show more craftsmanship on the blade, however dragons have no significant meaning. It is purely handmade carving done by very skilled craftsmen using only basic domestic tools.